Nsasoft Product Key Explorer is the best product key finder software for recovering and finding product keys to over +8000 programs: Windows 8.1, Windows 8, Windows 7, Windows 10, Microsoft Office, Adobe CS6, CS5, CS4, CS3, Acronis, Electronic Arts games, WinZip, Nero and more. 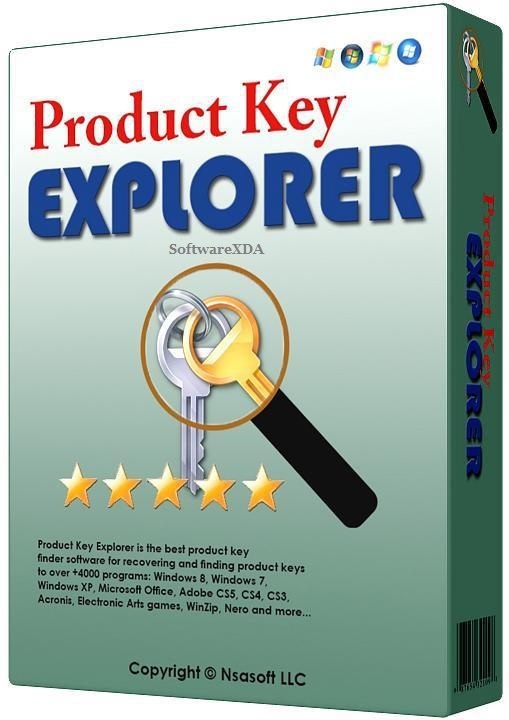 Product Key Explorer is a powerful product key finder solution for Windows, designed to help users find, recover and backup activation keys for +9000 popular software programs installed on local or network computers. Find product keys for over +9000 most popular programs: Windows 8.1, Windows 8, Windows 7, Vista, Windows 10, Microsoft Office, Adobe CS6, CS5, CS4 and CS3, Norton, Electronic Arts games, WinZip, Nero and more… Visit “Features” page to see all supported software list of programs with which product key finder works. The Best Product Key Find and Recovery Software with Product Key Explorer you can recover lost product keys for all major software programs, prevent losing your investment and money.